Former Hollyoaks actor Marcus Patric featured in Hello! magazine recently when he and girlfriend Georgia Martin introduced son Ethan, 6 weeks, who was born on October 4th at Queen Charlotte’s Hospital in London. October 4th was especially poignant for Marcus as it was also the date he sadly lost his dad when he was only 7 years old. Georgia: I had some morning sickness. My mum was a great help while Marcus was away [competing in 71 Degrees North — which he went on to win], coming with me to appointments. But when [Marcus] got back at the end of March, it was wonderful to be together again. Marcus: When Georgia’s waters broke in the morning, we drove to Queen Charlotte’s Hospital in London. What I couldn’t get over was the significance of the day he decided to come — the same day my dad died of a heart attack at the age of 38. I’ve grown up without my dad — you never come to terms with a loss like that. [But] on the date I lost my dad, I gained a son. He’s a little miracle. The pain of [losing my dad] will never 100 percent go away, but having my son now helps me a lot. It’s a wonderful thing to have happened — that on what used to be such a dark day for my family, Ethan was born. M: He has Georgia’s dark hair and my tiny ears, which run in the family, and my nose. So he’s a mixture of the two of us. He’s a lovely little man — all I could hope for and more. G: I didn’t cry at the time, but I realize now it’s because I was in total shock over what happened. Oh my God, he was so beautiful. Now we just spend all our time together looking at him. I can’t wait to wake up every morning just to see him. G: As soon as I gave birth, I knew I wanted another one. And I like the idea of getting married — the big party and the dress, the lot. M: Oops, I think my wallet has just jumped off the roof terrace…I’d definately like more children. As far as getting married is concerned, we’ll know when the time is right. G: People sent cards and Susie Amy sent us a lovely pram set. I think we’ll be arranging something soon, as they all want to see Ethan. Source: Hello! Magazine Issue: 1149 Date: November 15th 2010. Photos by Hello! 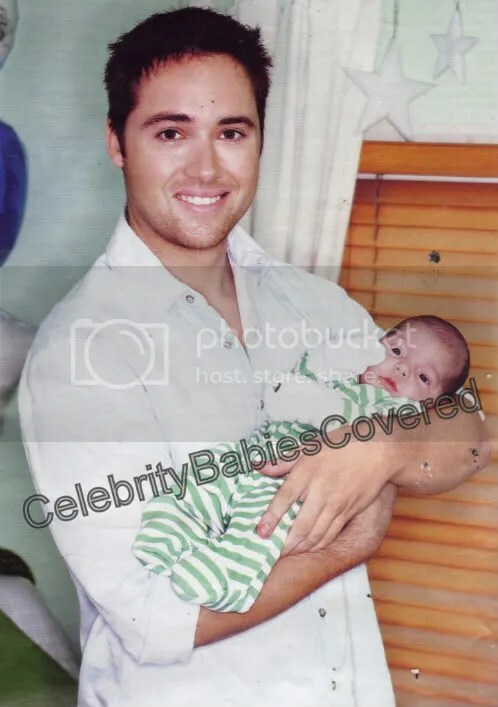 This entry was posted in Dad and Baby Photos, Interviews, Introducing, Magazine Shoots, Mum and Baby Photos, News. Bookmark the permalink.